Preheat the oven to 190˚C, gas mark 5. 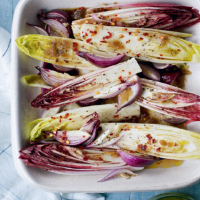 Put the chicory and onions in a baking dish and sprinkle over the sugar and chilli. Drizzle with the oil and vinegar. Season. Place in the oven. Bake for 35 minutes until golden and caramelised. Serve hot or at room temperature. This recipe was first published in Thu Mar 24 12:23:41 GMT 2011.